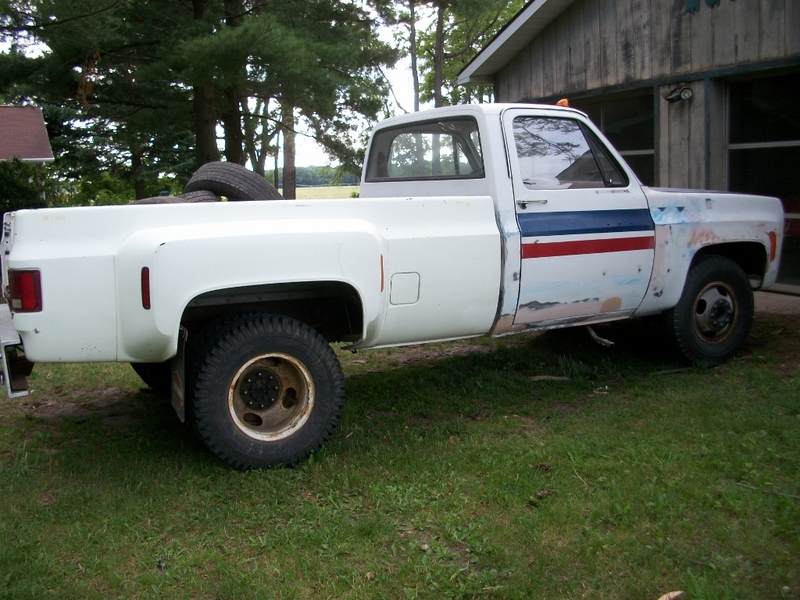 My initial plan was to leave this mostly alone, and just use it to haul junk and brush, plow snow in the winter and serve as a “beater”. But, as they say, anything worth doing is worth doing right (or, CLOSE to right, anyway! 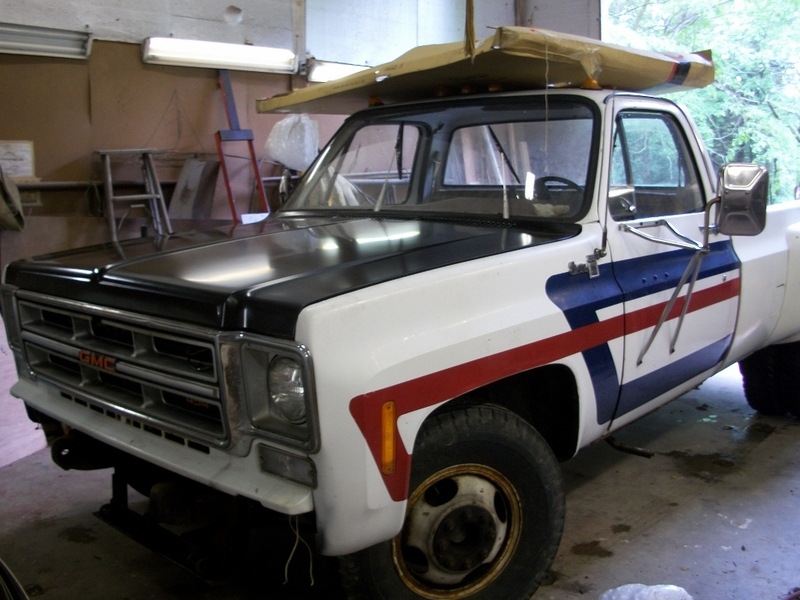 ), so I present the GMC “Big Dually” almost ready for paint. The first step was to install the new hood (a HUGE improvement in the appearance all by itself). This lead to my spending a couple of hours getting the front fenders properly aligned, which I never really did when I installed them almost 30 years ago. A little tweaking, some fender shims, and a little leverage with a pry bar got the fenders aligned correctly with the hood and the doors. 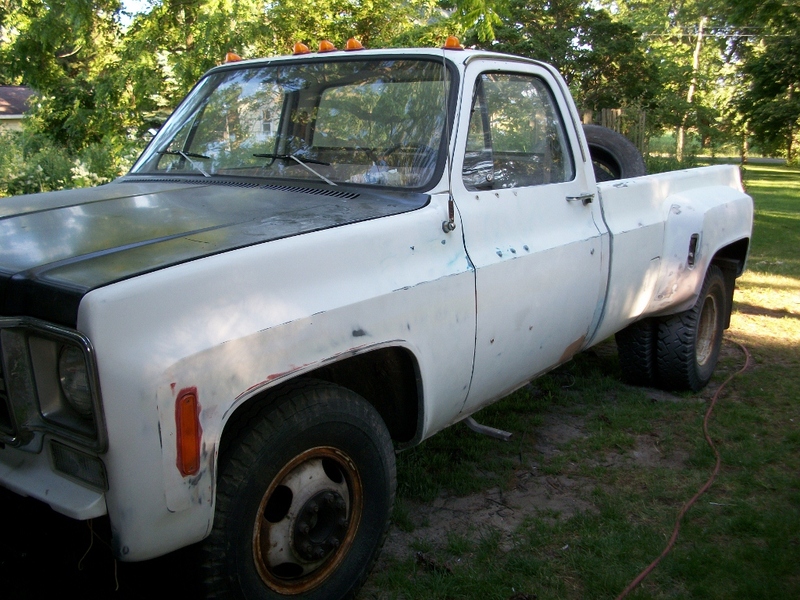 If you are old enough to recall panel fit on new GM pickups in the 70’s, you know 3/4″ gaps were considered acceptable. It’s not easy to get it pared down to 1/4″, but I did a pretty good job. Once that was done, I made the mistake of sandblasting the rockers and floorboards. I knew the floor was lacy on the driver’s side, but when I was done, most of the floor on ‘ was gone, and the rockers were “lacy” as well. So, I made a new rocker skin for the driver’s side, and new cab corners for both sides. The passenger side rocker was OK, so that was easy. I’ll admit to “splooging” the inner rockers, a trick my buddy John showed me. 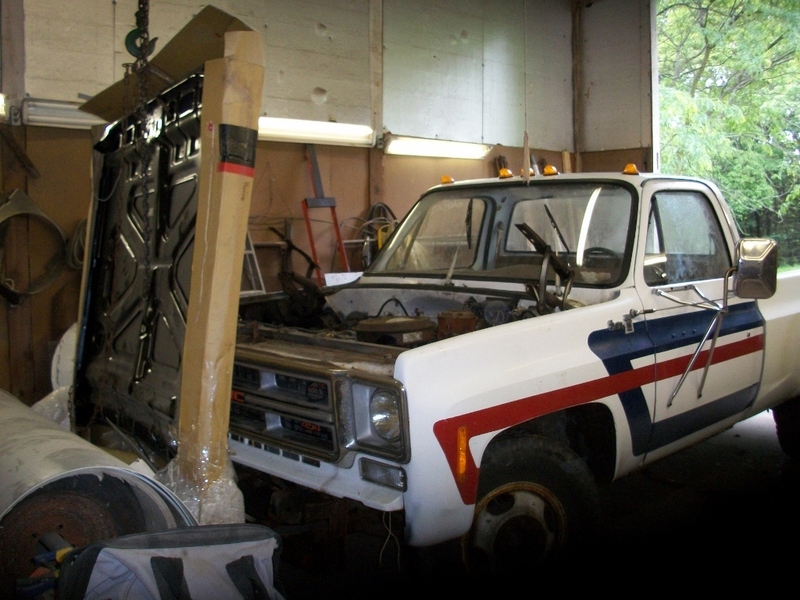 This involves a product called “Chassis Saver”, some fiberglass matt, and a little clean up with a blaster. Once the scale is blasted off the offending (offended?) area, a coat of “Chassis Saver”, an epoxy coating which is activated by moisture in the air and 02, is brushed on, the ‘glass mat laid in the wet stuff, and then saturated with more of the stuff. The result is a solid, epoxy encapsulated patch that will last as long as the rest of metal around it. At least in theory. Next, the chore of prepping the body for paint. 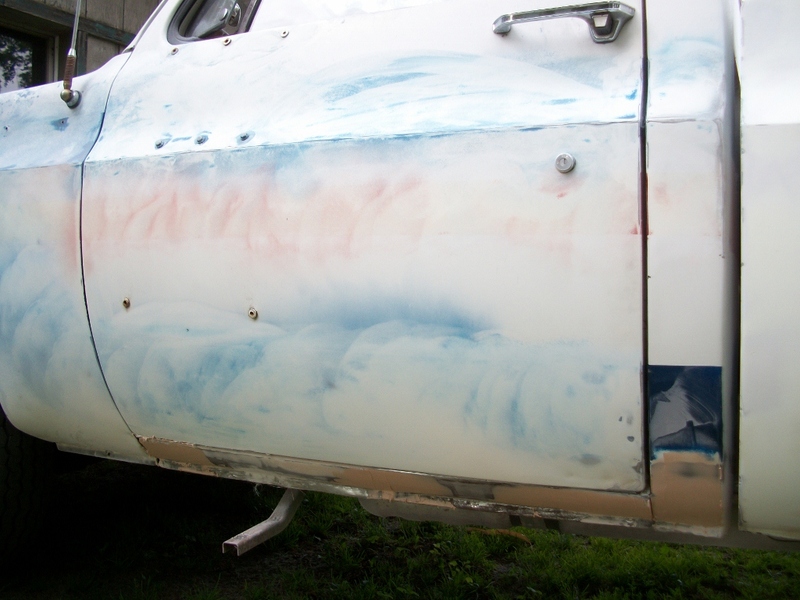 The box has, or had, at least 4 coats of white enamel, and some really poorly done body work on the left rear corner. A couple of trips over the box with the DA loaded with 80, then 100, and finally tonight 220 gr paper has it pretty much ready for primer. I found a couple little spots needing some bump work, but it’s looking pretty straight. 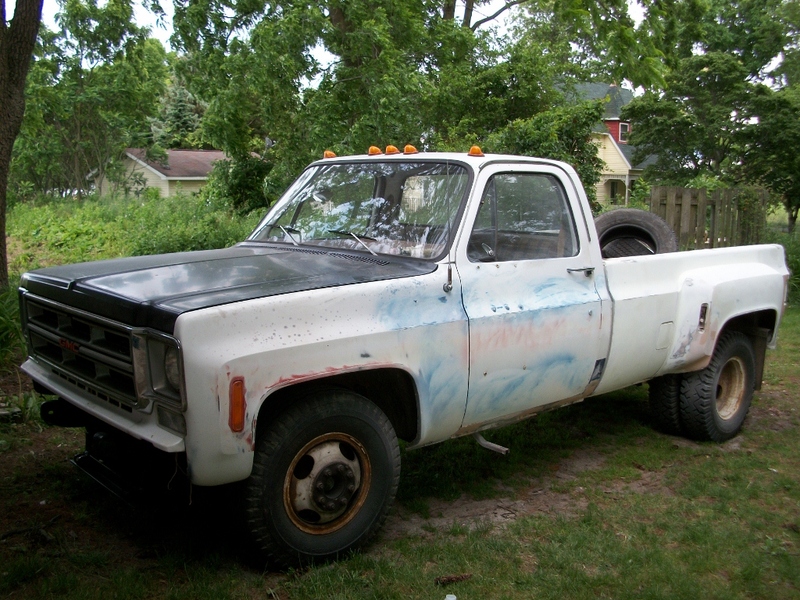 The cab, the original part of the truck, I’d painted when I replaced the original (rusted out) front fenders 30 years ago. 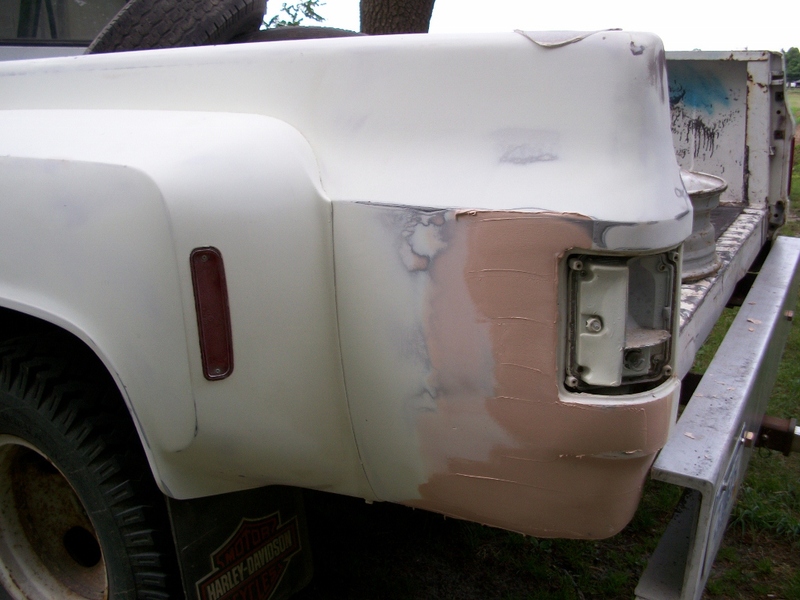 The sloppily applied graphics are now gone, and the very little bodywork done to the cab corners and rockers is done. The fenders had some minor problems which I ignored the first time around, this time I straightened up the ripples, and with them finally adjusted and fitted correctly with good panel gaps, I’m happy with how the body looks. With graphic stripes gone, and the truck an almost uniform white color, the “blocky” look is gone, and it looks MASSIVE. Long, wide, and tall, I always liked these square bodied dually’s, the “Cowboy Cadillac” of the 70’s. 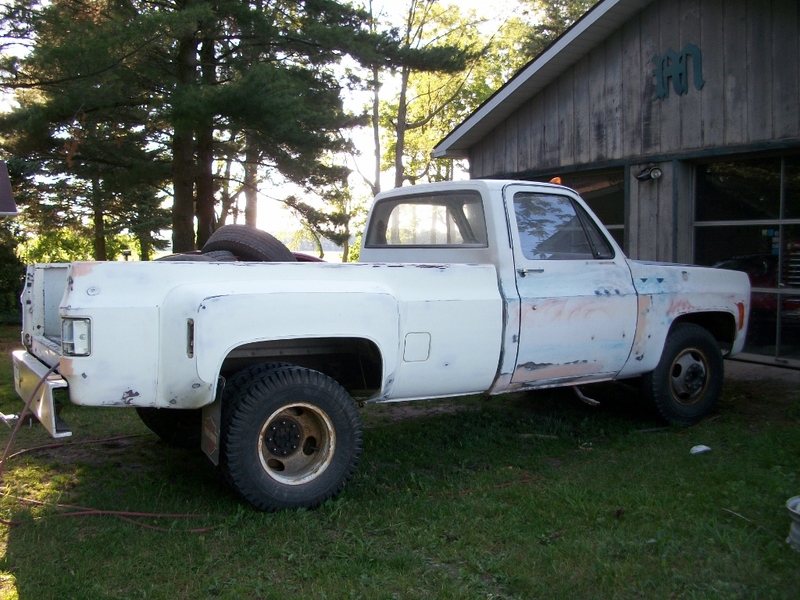 I ordered a gallon of “Kirker” acrylic enamel, gloss hardener and reducer from “Smart Shoppers” for the ridiculously low price of $83.50, shipping included, so by next weekend, the truck should be a uniform glossy shade of Stark White. It may not be straight enough for black, but it certainly is good enough for white. I’m kinda excited about it, and anxious to see it all one color. Finally. One minor glitch, just to keep me humble, was getting the tires mounted on the new wheels. 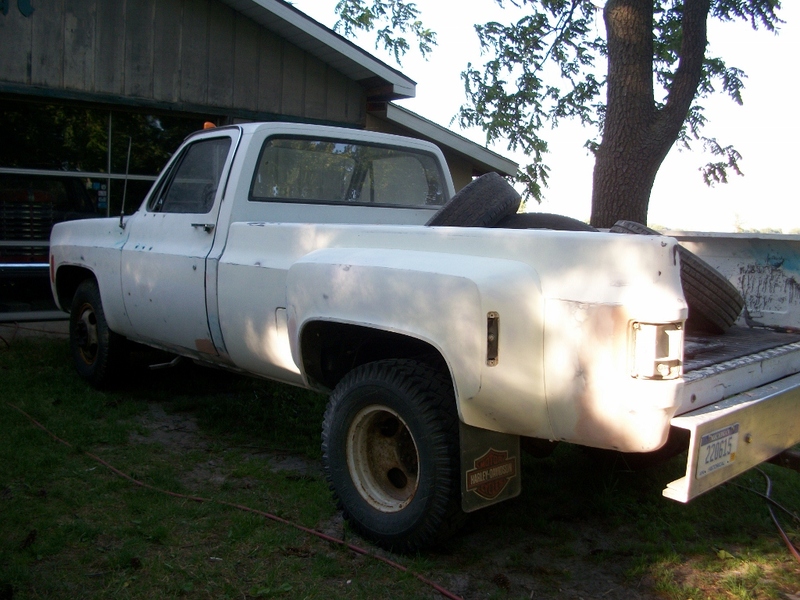 I’d bought 5 dually wheels, as I had one that was with the truck. It still has the original tires on the original split rim wheels. I had four 8 ply Michelon tires, bought two more for the front, and dropped all six off at the local garage. When I picked them up, they found I had five 16″ wheels, and one 16.5″, the wheel I had. So, now I have to find one more wheel to get the new rubber on the truck. It would have SO easy to buy one more wheel at Bontragers for $20, but NOOOO, I already had one, so I didn’t by six! Oh well. Stay tuned, hopefully the next time we see the “Big Dually”, it’ll be hitched to the new Spartan Manor I hope to fetch home with it in a couple of weeks!